February 10th marks the anniversary of the birth of one of several men who may well have been the father of swing music—the incomparable Chick Webb. Chick was born William Henry Webb in Baltimore, Maryland. The year of his birth has been disputed, with 1902, 1905, 1907, and 1909 all suggested, though ’05 is the most likely candidate. As a child, tuberculosis of the spine stunted his growth and led to his hunchbacked appearance. His doctor suggested the young Webb take up the drums to help alleviate his condition, so he worked as a newsboy to save up enough money for a kit. By the mid-1920s, he was leading a band in Harlem. After one unissued side for Vocalion in ’27, Webb cut his first record for Brunswick in 1928, issued under the pseudonym “The Jungle Band” (a name usually reserved for Duke Ellington’s recordings on that label). These two Brunswick sides, titled “Dog Bottom” and “Jungle Mama” were stomping hot jazz. In 1931, Webb’s orchestra became the house band of the famed Savoy Ballroom in Harlem, Following a ’31 date with Vocalion, Webb signed with Columbia, waxing thirteen sides in 1933 and ’34, four of which appeared on their subsidiary Okeh label. Two months after completing his final Okeh recordings in July of 1934, Webb signed with Decca, which would last him the remainder of his career. Not too long after beginning his contract with Decca, Webb brought on a new girl singer by the name of Ella Fitzgerald. In a number of “battles of the bands” at the Savoy, Webb and his orchestra bested the likes of Benny Goodman and Count Basie, though he once lost to Duke Ellington’s band. By the end of the 1930s, however, Webb’s condition was catching up to him. Following an operation at Johns Hopkins Hospital, Chick Webb died on June 16, 1939 in his hometown of Baltimore. 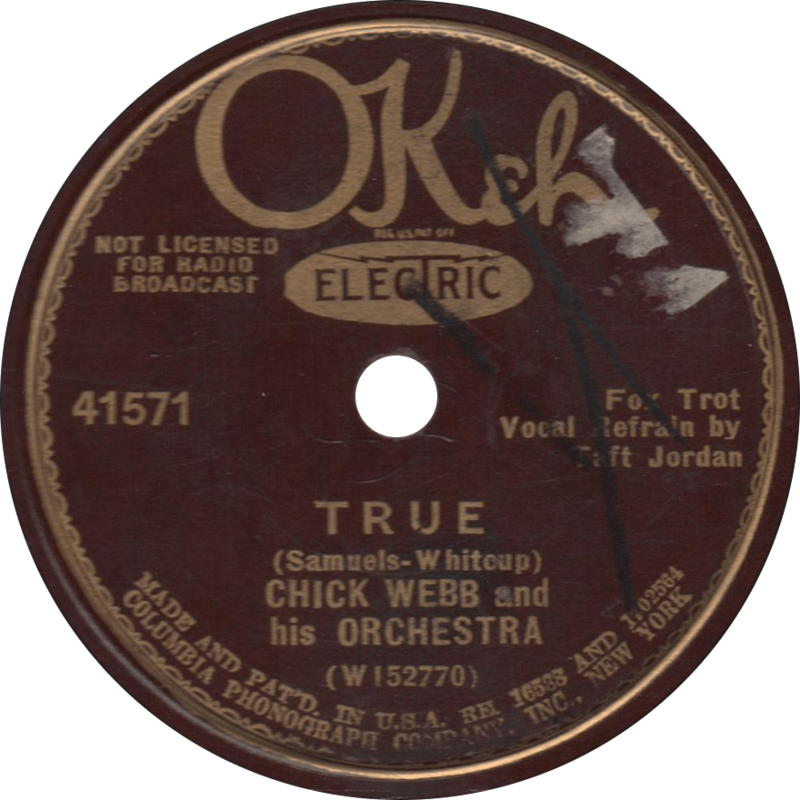 Okeh 41571 was recorded on July 6, 1934 in New York City by Chick Webb and his Orchestra. Purportedly, matrices W 152770 and W 152772 were the last masters recorded by the Columbia Phonograph Company before its absorption into the American Record Corporation. Webb’s Orchestra is made up of Mario Bauza, Bobby Stark, and Taft Jordan on trumpets, Sandy Williams and Fernando Arbello on trombones, Pete Clark and Edgar Sampson an alto saxes, Elmer Williams and Wayman Carver on tenor saxes, Joe Steele on piano, John Trueheart on banjo and guitar, John Kirby on string bass, and of course Chick Webb on drums. First up, baritone Charles Linton delivers a wonderful vocal on Webb’s all-around magnificent rendition of the 1932 “Fats” Waller, Don Redman, and Andy Razaf standard “If it Ain’t Love”. 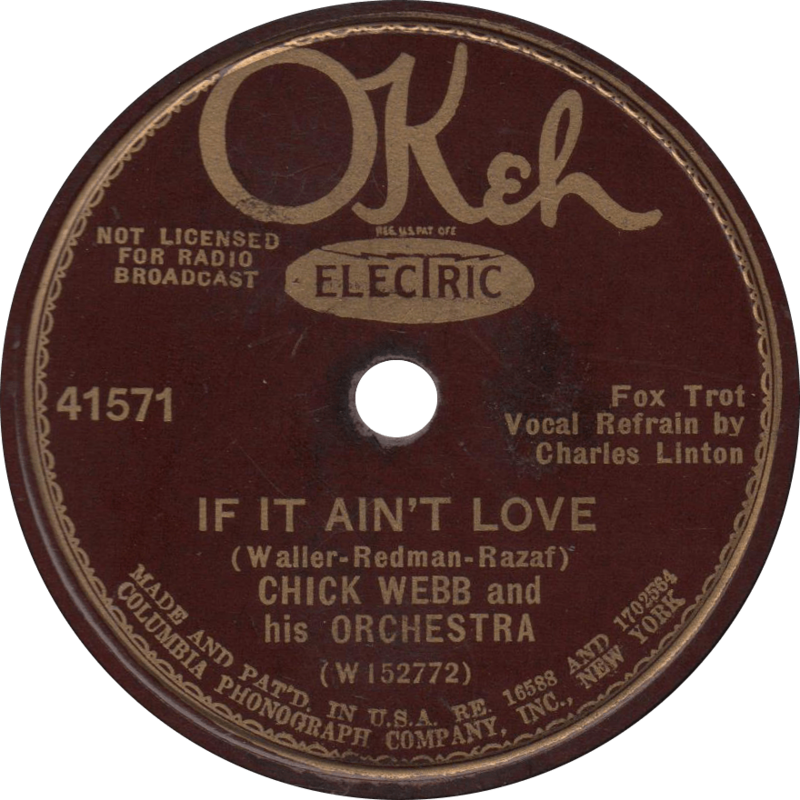 If it Ain’t Love, recorded July 6, 1934 by Chick Webb and his Orchestra. Next, trumpet man Taft Jordan performs a Satchmo style vocal on “True”. True, recorded July 6, 1934 by Chick Webb and his Orchestra. This entry was posted in Records and tagged 1930s, 1934, Andy Razaf, Bobby Stark, Charles Linton, Chick Webb, Don Redman, Edgar Sampson, Elmer Williams, Fats Waller, Fernando Arbello, Jazz, Joe Steele, John Kirby, John Trueheart, Mario Bauza, Okeh, Pete Clark, Sandy Williams, Swing, Taft Jordan, Wayman Carver by R. Connor Montgomery. Bookmark the permalink.